​The teachers have endless patience and you can tell they care deeply about the children and have a passion for teaching early childhood. -Laura L.
We are truly blessed that we have three wonderful teachers here at LPNS. Every teacher brings their own special set of strengths and skills to the classroom. To ensure that our students get the most out of their experience the teachers take turns planning, setting up, and being responsible for a different room every 4 weeks. Their education and experience give them an awareness of the needs of every child, ages 3-5, and provide varied activities accordingly. Mrs. McIntosh lives in Lakeside with her family. She graduated from UMD with a bachelors in education with a teaching science minor. She and her husband lived in Laramie, WY for 5 years. They moved back to Duluth in 2006 where she stayed at home with her two children. Both of her children attended LPNS and she is excited to be able teach here. Her favorite part of the job (besides the children of course) is coming up with dramatic play centers and activities for the children to participate in. She feels the children lead her to the best ideas. Mrs. Cohoon lives in Lakeside with her husband and grandson. They moved to Duluth in 2013 after returning for the second time from Saudi Arabia where they spent 16 yrs. While there, Mrs. Cohoon applied her 30 plus years of experience to teach preschool. During her career she has worn many hats from teaching, directing, and helping to design a preschool center on the compound where she lived. Mrs. Cohoon earned her associate in applied science degree in early childhood development in North Carolina. 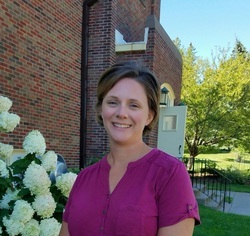 The past two summers Mrs. Cohoon has volunteered with the church's VBS program. Her favorite part of teaching is witnessing the reaction of joy upon children's faces when they learn something new. ​Mrs. Remus has lived in Cloquet with her husband and two boys for the past 17 years. She has a bachelor’s degree in communications from the College of St. Scholastica. After 10 years as a stay at home mom and active member of her church’s preschool board, she was hired as the preschool director in 2010. Discovering she loved this work, she went on to an early childhood center, where she spent several years developing her skills as an aide, assistant teacher and a lead preschool teacher. She is currently pursuing a second bachelor’s degree in early childhood. Her favorite part of working with children is watching them grow and learn through exploration. She’s excited to be part of LPNS, because she believes “play” is a child’s most important work.